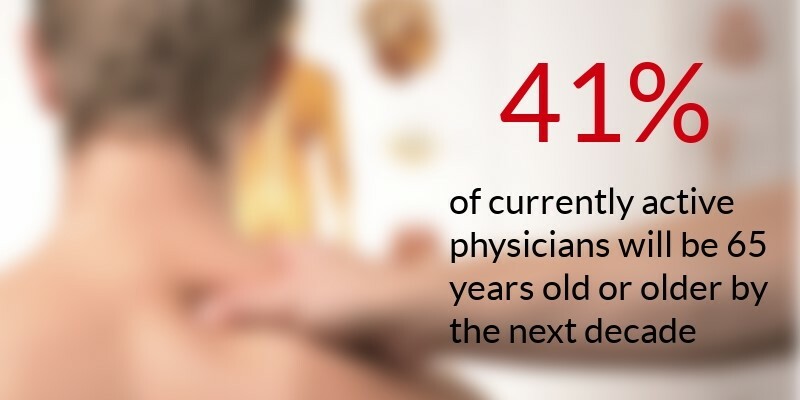 In the 2018 Survey of Physicians, Practice Patterns and Perspectives commissioned by The Physicians Foundation, the number of aging physicians and the number of disenchanted physicians continues to outpace those that are entering the field and willing to work at the same pace as their predecessors. See, United States physicians handle over one billion transactions with patient each year. For office-based physicians, the combined economic output of $2.3 trillion per year. If you are a practicing doctor, physician assistant, nurse practitioner, fellow, resident physician or medical student you will feel the shift in the coming decade. Medical specialists have a less optimistic outlook on medicine than do primary care physicians. Female doctors are less likely to recommend medicine as a career to their children than are male physicians. When this is combined with relevant statistics about physician aging, population aging and number of individuals with chronic diseases like obesity, it is clear that the wait time to see a doctor in the coming decade will be longer. Optimize your own vitality. Minimize your need for personal medical attention by eating foods that fuel your cells, drinking beverages that support cell function, prayer and meditation to feed your spirit and movement to keep your muscles at peak performance until you no longer have a need to use them. Build a practice plan and exit strategy that serves you now and into your own retirement. Any malalignments between your personal mission and your practice mission will not serve you long term. Reassess yearly. Mend and fortify relationships. Life is relationship, with self, with surroundings and with others. Forgive yourself for your mistakes then forgive others. Invest in improving your communication skills. Make time to nurture. Take action now and you’ll be amazed at how much more energy and excitement you bring to your practice and your patients. Previous PostWhat if published medical research results that doctors use to guide treatment are unreliable?